Shinzo Abe campaigned on taking Japan back to the future. Have the nation’s voters got what they wished for with the Liberal Democratic Party’s (LDP) stunning election victory on Sunday, delivering the 58-year-old his second stint as leader? For the defeated Yoshihiko Noda of the Democratic Party of Japan (DPJ), the poll was a devastating electoral backlash against, among other things, his push to increase the consumption tax. Noda’s defeat is therefore reminiscent of the one that befell conservative Ryutaro Hashimoto in 1997. In a landslide for the party which was ousted from power in 2009, the LDP and its likely coalition partner, New Komeito, are expected to win a combined 325 of the lower house’s 480 seats, providing the two-thirds “supermajority” needed to force legislation through both houses of the Diet. For the DPJ, the election is likely to reduce the Party’s parliamentary seats to just 53, down from its previous 230 seats. Noda has resigned to take responsibility for the electoral pummeling. Meanwhile, a third force, the rightist Japan Restoration Party led by nationalist former Tokyo governor Shintaro Ishihara, secured 54 seats, only three less than the center-left DPJ. 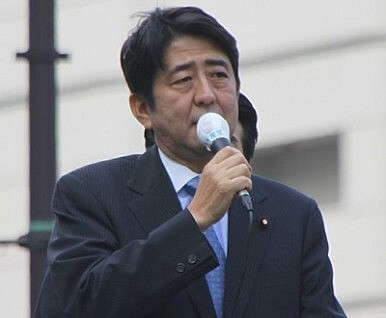 Noda was forced to call an election as part of a deal with the opposition to get through a consumption tax hike, which will rise to 8 percent in April 2012 and 10 percent in October 2015. The DPJ’s electoral prospects were also damaged by party infighting, its handling of the March 2011 disasters, foreign policy rows with Japan’s neighbors and an intransigent opposition-controlled upper house. Abe will be installed next week as Japan’s seventh prime minister in six years, and the first LDP leader since its decades-long rule ended in 2009. He has vowed more government spending and monetary expansion to drag the economy out of its deflationary downturn.